Watching Durham Bulls Baseball: What If? For the stats geeks, one play made all the difference. For the fans, not so much. As Blake Snell started the 6th he was moving into unknown territory, having not gone more than 5 innings this year. He gave up a single. The next play was a very hard grounder just to the left of second base. Bulls shortstop Daniel Robertson knocked it down, but could not start the double play. Result: runners on first and second, no outs. In our section of the stands, the ruling was 3-1 to call the play an error on the shortstop. The official scorer called it a hit. Snell then got an out, but next gave up a home run and the Bats were ahead 3-2. He walked the next two batters and was pulled from the game. His replacement, new guy Danny Farquhar, let one of the baserunners in. So all four runs were charged against Snell and his ERA went up quite a bit. If it had been an E6, some of those 4 runs would have been unearned. On the other hand, the Bulls had their first error-free game in a long while. They committed 11 in the previous six games. This was as dismal a home stand as I can remember. Unless something got on track on the bus ride to Louisville, it’s not going to get much better. The Bulls play five games games against the very same teams they just played in Durham — two against Louisville and three against Indianapolis. Joey Rickard, who was a great-looking young Durham Bull at the end of last season, went to the Baltimore Orioles in a Rule 5 draft action. He beat the Rays the other day. 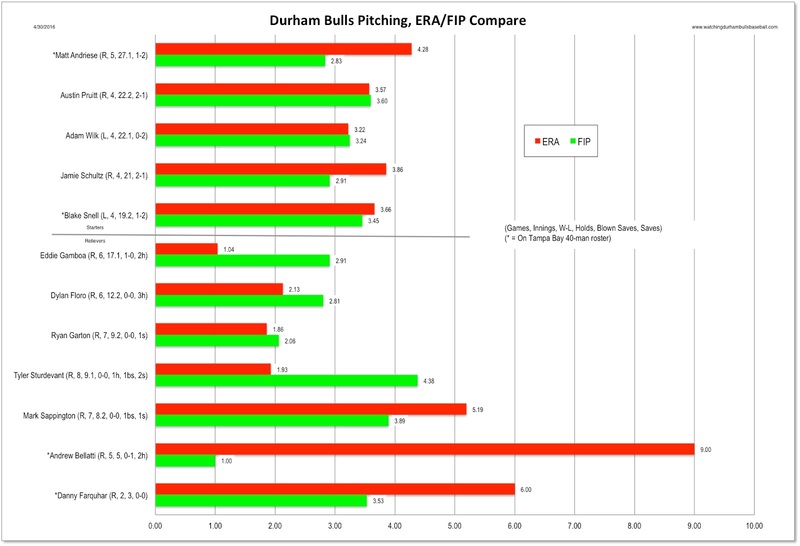 The ERAs and FIPs(Fielding Independent Percentages) of the Durham Bulls pitching crew, sorted by innings pitched. the usual early season, small sample warnings apply.